Cloud business mail has not meet expectations in the last four years? Some interesting numbers can be found in the research of the Radicati Group. This company specializes in researching e-mail, security, instant messaging and social networking with a focus on enterprise market. In the study entitled “Microsoft Exchange Server and Outlook Market Analysis, 2010-2014”, we see that on-premises Exchange in 2010 has 76% of mailboxes as opposed to 15% being hosted and 9% from managed Exchange. The research predicts a decrease of on-premises Exchange to 72% over the next four years. In the “Microsoft Exchange Server and Outlook Market Analysis, 2014-2018” study, the numbers are the direct opposite. The findings show that the number of on-premises Exchange mailboxes have increased to 83%. 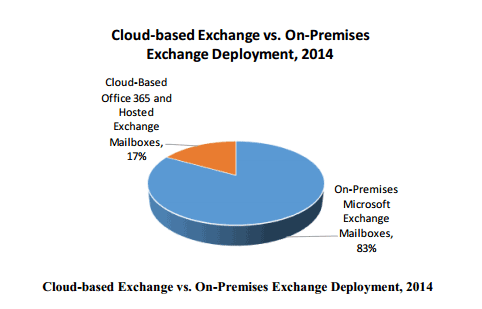 The total share of could-based Exchange, including Office 365 and hosted is only 17%. Government regulations concerning protection and storage of e-mail. Risk of storing restricted information on 3rd party servers. Lack of the security control for the owner of the data and concern about security level. The rapid move to the cloud of e-mail and e-mail archiving, predicted by many experts in 2008-2012, did not happen in 2013-2014. With the overall increase of Microsoft Exchange Server market share (about 2-3% annually) the number of on-premises Exchange mailboxes is still increasing fast despite predictions and the aggressive pushing of cloud technologies.